This quote comes from Samantha Ettus, a 44-year-old mother of three whose book “The Pie Life: A Guilt-Free Recipe for Success and Satisfaction from Ghost Mountain Books, came out yesterday. She states that she was already receiving hate mail even before the book came out. I can certainly see why Ms. Ettus would be receiving hate mail. Her main message in the book is that all women should work. I could not disagree more with this. All women already DO work. They don’t have to work outside the home when the children are young in order to maintain their sanity, as Ms. Ettus suggests. “Where you see a woman who is not an independent pursuit of her own life goals, you’ll likely find an anxious child, an over-perfected home, a marriage out of balance and a school administrator who wishes this woman would get a job,” Ettus says. Wow. Those are some fighting words. Attaching a stay-at-home mom’s child, her home, her marriage, and her child’s education – those are hefty accusations. As a mom of three who has worked full-time (and traveled) in a corporate setting while juggling kids in full-time daycare, done part-time consulting work, and has also been a stay-at-home mom – I feel like I have authority to disagree. I have been my happiest when I have put my family first. This is what works best for my family and for our lifestyle. I felt like a gerbil in an exercise wheel when we had two children in daycare nearly 50 hours per week. I was only spending 90 minutes per day with them while they were awake, and some of that was in a car driving them to and from the day care center. I got home in time to feed them, bathe them, and then squeeze a few bedtime stories into the tiny amount of time I had with them before they fell asleep from their exhausting day. When I slowed down and stopped working outside the home, I felt like my husband and I could breathe again. I could have dinner ready and waiting for my family when my husband walked in the door instead of rushing through a junky meal as quickly as we could so the bottles for day care could be washed and lunches could be packed for the next day. Small things I did while at home could make my family’s life incredibly easier. Just handling all the house “stuff” – being home to greet the deliveries, keeping laundry done, handling the household maintenance – made our family time together so much more enjoyable. Our weekends became quality time to spend together instead of running errands and we began to enjoy the company of our family. We didn’t feel pressured to make every moment a magically memorable one and getting rid of that pressure made us enjoy the everyday, common (even mundane) moments we shared as a family. Early Sunday morning cuddles were welcomed instead of rushed through. Saturday afternoon swim classes became a ritual that one parent enjoys with one child instead of a dash through the day so we can shove more activities into our two quality eight-hour shifts with our children. 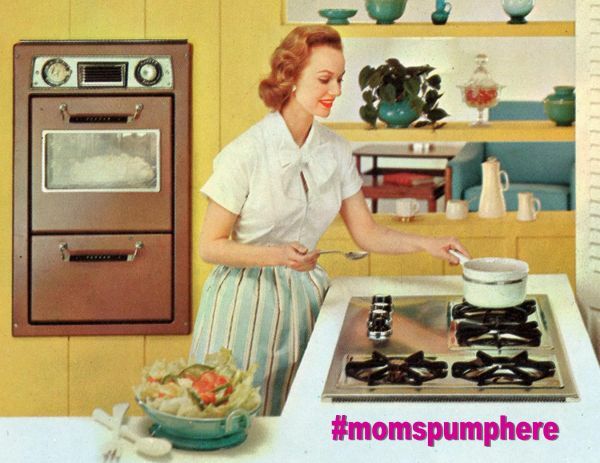 Ms. Ettus – we at Moms Pump Here invite you to share two glasses of Chardonnay with some happy moms who feel their priorities are in the right place. I recognize every situation and every family is different, but I will gladly share with you how happy I am with my family life and I’m confident I won’t be alone with my thoughts and feelings.